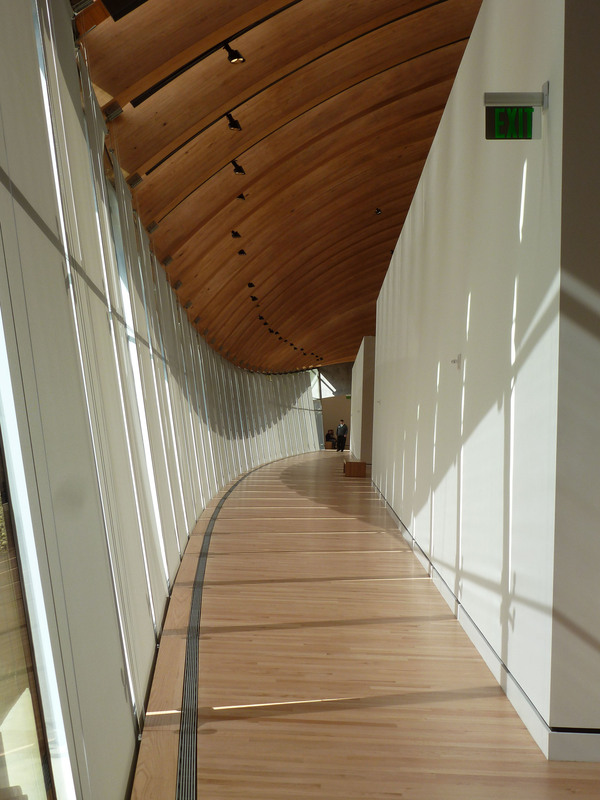 I gotta say, Alice Walton has built a fantastic museum for American art. This review says it better than I could, or have time, to say. The surroundings are lovely – hilly with lots of trees. The walking trails are interesting. Yes, there could be more art and I believe that is the plan. What's there now is good. The building is segmented. 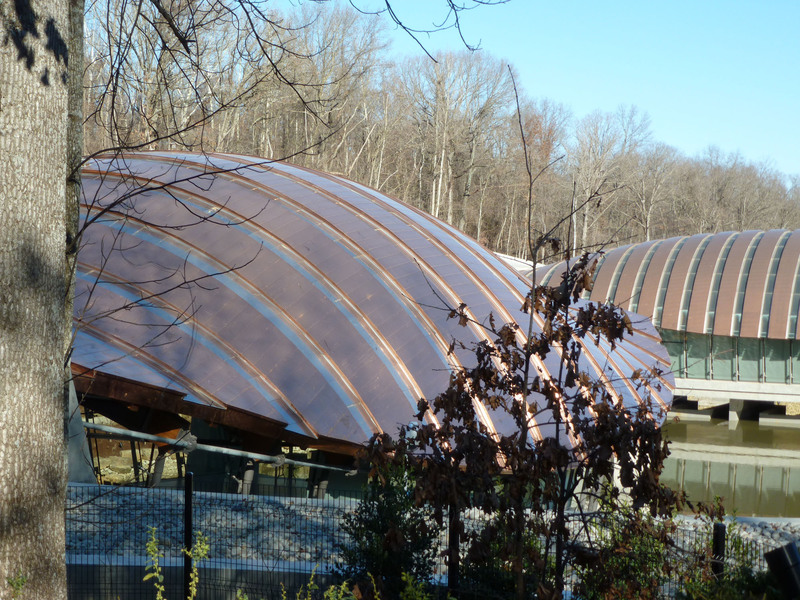 The copper-clad sections reminded me of roly-poly shells. Can you see our shadows? 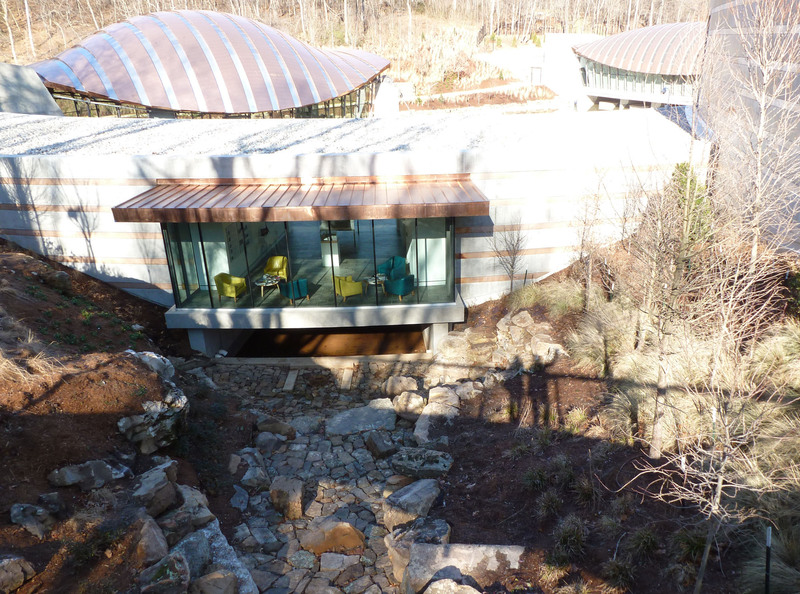 We are standing on one of the walking path's bridges behind the museum. I sat in one of the green chairs behind the glass later. Very comfortable – wish I had one. The structure on the inside is light and airy. There is no admission charge. Parking is free. The museum staff is friendly and helpful and protective of the art. Honestly, I was reminded of Walmart greeters, but in the best way. I took a few photos to share, with quilters in mind. 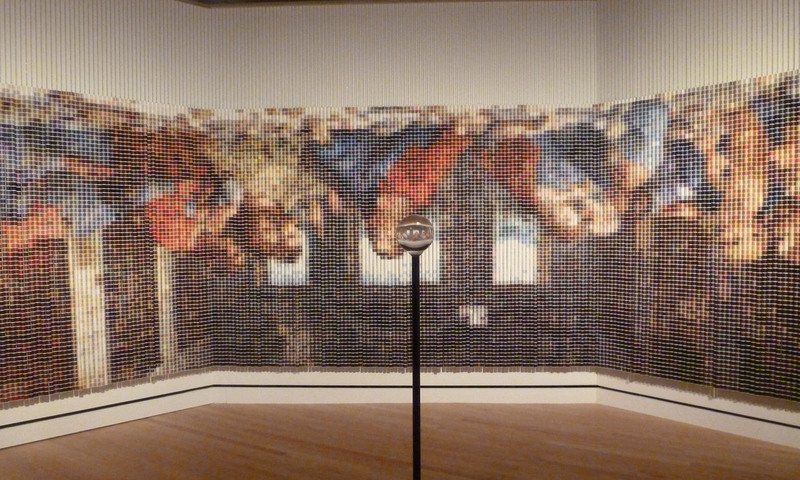 This version of the Last Supper is made of spools of thread (DMC I'd bet), hung on chains. It is huge. 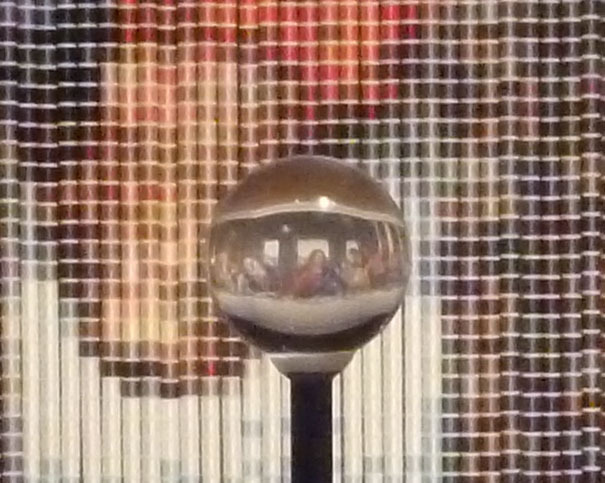 When you look through that small glass globe, the image is right side up. I loved the piece below by Mary McCleary. 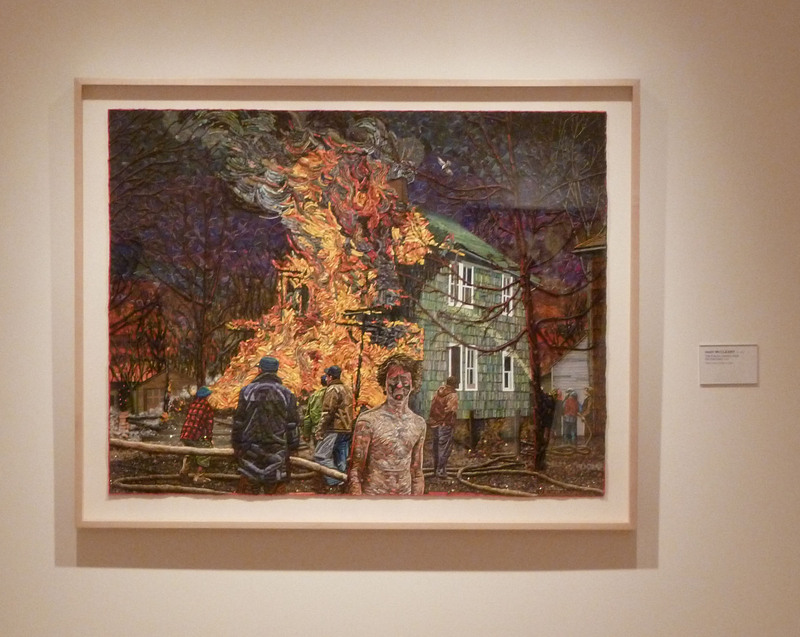 This is a mixed media collage and it is amazing. I had a detail shot and have lost it!!! Click this link to see more on her site. This one sort of makes my head hurt. 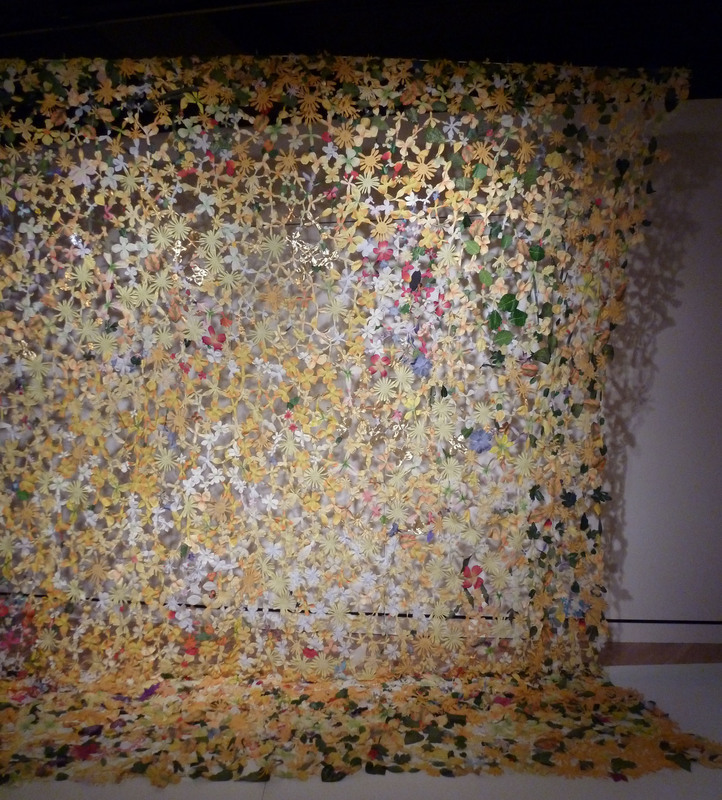 It is a very large curtain/screen made from deconstructed silk flowers that have been sewn together. When I walk through a museum and come across something like this, I give it my garage sale test. "If this was in a garage sale, would I buy it? Would I even stop to look?" Perhaps it is because I am a quilter, this one didn't pass the test for me. Luckily for the artist my opinion doesn't matter one bit. 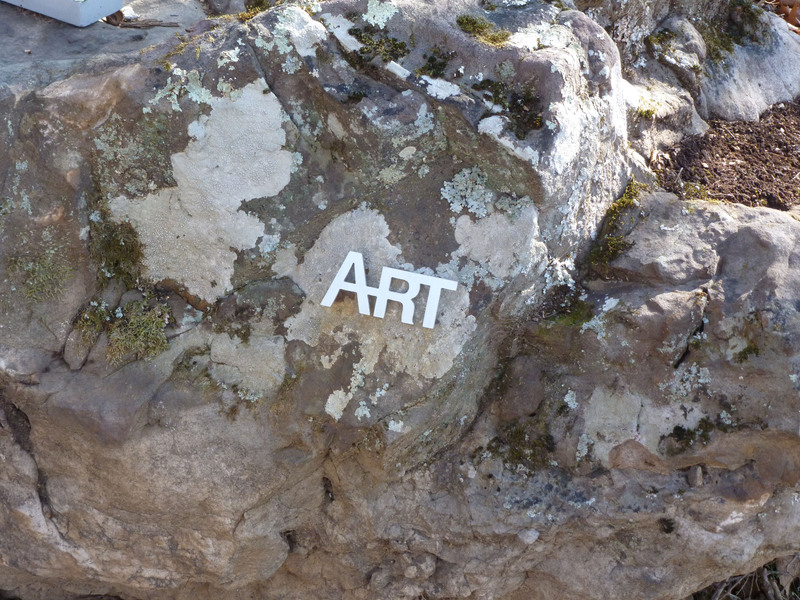 Another artist played with the 'what is art' question outside. There are several boulders along the walking paths with important looking chrome numbers on them. Look close and you will also see that they are labeled ART. The boulder, the rock, is the art. Subtle and interesting. The museum store was very good. I didn't buy this tree but we did find a wonderful cane for Mom. It's pretty and it comes apart like a tent pole. 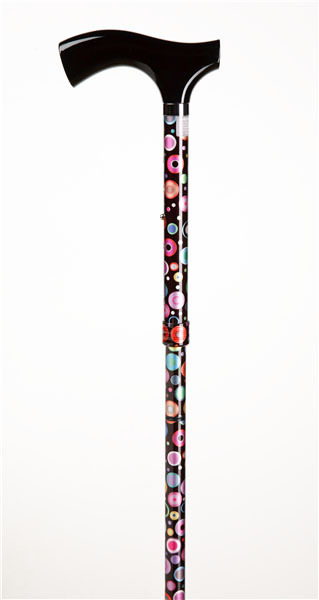 The kind of pole where there is elastic inside. If you haven't put up a tent lately, go to this site for more info. It was a good trip. Steve and I visited and enjoyed time off with no real agenda. I did do some sketching and a lot of thinking about what quilts are next after we finish the book we are working on. I caught up on my magazine pile. Thanks for sharing, Becky–I’m not likely to be in AR ever, so it’s nice to be able to see some of what they have to offer–certainly an interesting museum with an interesting story. Love the cane–the tent poles were always a fun part of setting up the tent–they work so well & make a very satisfying snap when they go together! I’ve been following your blog for a while and always enjoy it! So funny to see an article about the museum, my daughter works there! She is a barrista, she’s a student at UofA and far from home here in NJ.